Currently browsing posts filed under "9/11 Posts"
Brian Murphy ’80 died 17 years ago. The bookshelves inside Judy Bram Murphy’s light-drenched apartment on the Upper East Side of Manhattan are filled with photographs from before: a wedding portrait, a baby picture, a snapshot of Judy, her two daughters, and her husband, Brian. Looking at the photographs, you can almost pretend that September 11, 2001, never happened, that the two jets never flew into the World Trade Center towers. You can almost pretend that Brian came home from work that day. But Bram Murphy has no desire to pretend. Brian’s death left her a young widow and a single mother to Jessica, who was then five years old, and Leila, who was not quite four. Jessica and Leila are now 22 and 20, almost the same ages as my daughters. My wife, eldest daughter and I were at Ground Zero a few years ago, visiting my parents, whose office was nearby. My wife pointed out the site but my daughter did not remember 9/11. Do Jessica and Leila remember their father? How can they? Time steals all our memories, especially from the children. For Judy Bram Murphy, Brian is most alive in their children, in Jessica’s thoughtfulness and Leila’s adventurous nature. Because of this, her daughters triggered a sadness in her during the first six months after the attacks. Gradually this sadness began to subside, and she is now able to cherish the memories her children evoke. “They bring life and spirit to my life,” she says. What would your family remember if you were snatched away from them one clear sky morning? Is whatever else you are doing right now as important as that? “I’m not sure if I said it first or if they said it first,” she says, “but they feel he’s there all the time.” Bram Murphy takes comfort in that. She believes that such a sense helps the girls to feel safe and secure. “I don’t always feel his presence,” she adds, “but if I think about him, I feel he’s there in some spiritual way. He’s a part of me.” She chooses not to shield them from her own emotions, believing it important to show them that it is permissible to be sad and to cry. She shows them that the sadness passes. Heartbreaking. Sadness passes but never disappears. I hope that every father in the Murphys’ community kept a special eye out for Jessica and Leila as they grew up. They are all our daughters now. I read these stories every year, and every year I cry. Do you? Indeed. Why was Brian Murphy taken from both his own family and the community of Ephs? We should all be more thankful for what we have. We are all so lucky. I neither sew nor sculpt. What can I do? What can you do? Brian Murphy should still be there. Perhaps the lesson for all of us to be there, wherever we are, today. Much of the trauma of that day lives on. We are looking for Howard Kestenbaum. He was on the 103rd floor of the World Trade Center South Tower (the second building that was hit). If you have any information please contact me. That link worked five years ago, a constant reminder of the turmoil of those blue September days. It has since disappeared, like so many of our memories. 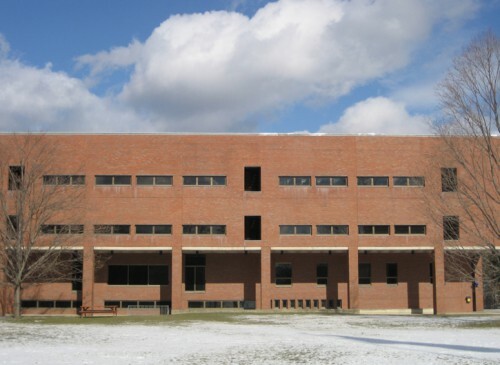 First years at Williams now were three years old when the towers fell. 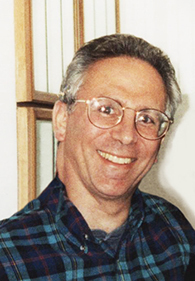 Howard Kestenbaum worked at the top of the south tower, the second to be struck. In the midst of chaos, his was a voice of calm and reason in the 78th floor sky lobby as people waited anxiously for the express elevators that were to take them to the ground floor. They could not know about United Airlines Flight 175, just minutes away from impact. Wein and Singer joined three of their Aon colleagues: Richard Gabrielle, 50, Vijay Paramsothy, 23, and the group’s boss, Howard Kestenbaum, 56. Two elevators in the north half of the lobby were out of service, but Wein’s group stood near one of the idle cars anyway; it was less crowded there than at the south end of the lobby. I’ve left my purse, Wein recalls saying. I don’t want to go back up, but how will I get the bus? “Here, take some money and go home,” Kestenbaum said. Singer remembered something she had left at her desk. No, Kestenbaum said. Don’t go back up. They stayed in the lobby. Kestenbaum was an athlete and wrestler at Williams. The College should honor him in a similar fashion. Perhaps the class of 1967 might to do the same for Kestenbaum in conjunction with the planning for their 50th reunion. Do wrestlers at Williams today know about Kestenbaum’s bravery? Why not a Kestenbaum Award, given to the member of the wrestling team who best displays the ideals of teamwork? A deafening explosion and a searing blast of heat ripped through the lobby. The air turned black with smoke. Flames burst out of elevators. Walls and the ceiling crumbled into a foot of debris on the floor. Shards of glass flew like thrown knives. The blast threw people like dolls, tearing their bodies apart. “Howard!” Judy Wein was yelling to Kestenbaum, her boss. Paramsothy was sitting up, scratched and bloody. Marble slabs had fallen onto Richard Gabrielle and broken his legs. Wein tried to move the slabs with her good arm, and he cried out. Howard Kestenbaum lay flat and still. To Wein, he looked peaceful. Dead and wounded covered the floor of the lobby like a battlefield after cannon fire. A ghostly dusting of plaster lay over everyone. Wein was soon saved by Welles Crowther, one of the many heroes of that sad day. Apparently Welles [Crowther] kept leading people down from the top floors to the lower ones, where they could make their way out. Then he’d go up to find more. No one knows how many. The fire department credits him with five saved lives. Crowther’s heroism is well-known, but there were so many other acts of courage that tragic morning. EphBlog remembers Howard and Linday and Brian. Who remembers Vijay Paramsothy, one of the thousands on hard-working immigrants who made and make NYC a city unlike any other? Who do you remember? Howard Kestenbaum was a Ph.D., a builder of models, a quant operating in the rarefied world of risk analysis. Yet only a modeller can know that models don’t really matter, that who we are and what we have done is much more to be found in the families we cherish than in the money we make. From the very beginning — when he accidentally fell on her at a party in the West Village — he made her laugh. He walked her home that night but, amusing or not, she wouldn’t give him her phone number. “Fine, thank you, and how are you?” Howie Kestenbaum replied. For 31 years of marriage, Howard and Granvilette Kestenbaum of Montclair talked every day, and he always made her laugh. All good husbands want to make their wives laugh. All of us should do as well as Howard. Gran Kestenbaum desribed her husband this way. Howard was a really good man. That may seem an ordinary epithet, but Howard thought of himself as an ordinary man — an ordinary husband, an ordinary father and an ordinary friend… He loved and cared for his family, helped friends, visited with the homeless, lonely and infirm. His modesty and leprechaun smile belied how quiet and graceful, without fanfare, the shining spirit of an extraordinary good man can touch and transform others. He would have been surprised that anyone noticed him, for that is not what he sought. And that is why we who love him are so honored to have known him, if only for a moment. Thirty one years of marriage and family, of trials and triumphs, does indeed seem like only a moment. May we all live our moments as well as Howard Kestenbaum lived his. How will you be spending today? Please spare a thought for Gran, Howard’s widow. 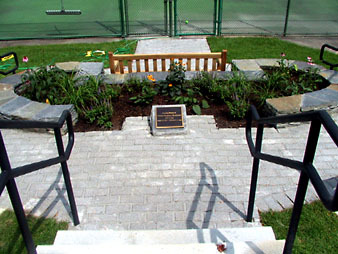 Brian Murphy ’80 died 14 years ago. Jessica and Leila are now 19 and 17, the same ages as my daughters. My wife, eldest daughter and I were at Ground Zero a few years ago, visiting my parents, whose office was nearby. My wife pointed out the site but my daughter did not remember 9/11. Do Jessica and Leila remember their father? How can they? Time steals all our memories, especially from the children. Heartbreaking. Sadness passes but never disappears. I hope that every father in the Murphys’ community kept a special eye out for Jessica and Leila this last decade. They are all our daughters now. Previous 9/11 posts here. Howard Kestenbaum ’67 and Lindsay Morehouse ’00 also died that day. There are many stories in the comments and links, all worth reading. …the campus learned that three alums had died in the towers. I had sat next to one, Lindsay Morehouse, in a notoriously challenging class, History of American Business. As a group of students we never really coalesced. Our professor, Robert Dalzell, was brilliant and old school. He strode into class, tossed his copy of whatever books or readings he’d assigned onto the long table, and then led the discussion,  off the top of his head. He called on people at random at least twice a class–hence, constant classroom anxiety. Lindsay may have been the only student to exude personal warmth in that environment, while the rest of us tried to stay calm. It still breaks my heart that the world lost such a kind person. The sky over Boston is as blue today as on that awful morning 7 years ago when the planes took off from Logan. Howard Kestenbaum ’67, Brian Murphy ’80 and Lindsay Morehouse ’00 will never again enjoy an Indian summer day, never again hold their family close, never again come back to the Purple Valley. Yet there memories live on, in each of us. 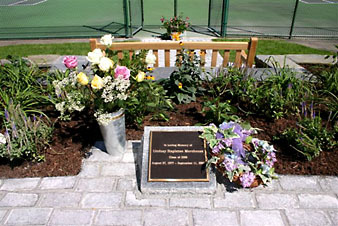 Brian Murphy ’80 died 6 years ago. Jessica and Leila are now 11 and 9, the same ages as my daughters. My wife, eldest daughter and I were at Ground Zero yesterday, visiting my parents, whose office is nearby. My wife pointed out the site but my daughter did not remember 9/11. Do Jessica and Leila remember their father? How can they? Time steals all our memories, especially from the children. Heartbreaking. Sadness passes but never disappears. I hope that every father in the Murphys’ community keeps a special eye out for Jessica and Leila. They are all our daughters now. Brian Murphy should still be there. Previous 9/11 posts here. Howard Kestenbaum ’67 and Lindsay Morehouse ’00 also died that day. Keefe, Bruyette and Woods, a stock brokerage and an investment bank, occupied three floors of the South Tower of the World Trade Center on the morning of September 11, 2001. 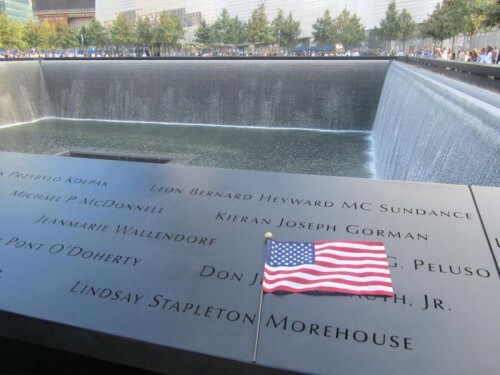 Lindsay S. Morehouse, a new research assistant, was working on the 89th floor when American Airlines Flight 11 struck the North Tower at 8:46 AM. As The 9-11 Commission Report describes in chilling detail, there was little consensus about what denizens of the South Tower should do. Howard Kestenbaum and others started to leave the building. Lindsay Morehouse did not. She and her co-workers did not know — they could not know — that United Airlines Flight 175 was only minutes away from impact. They stayed were they were. Flight 175 struck the South Tower at 9:03, crashing in between floors 78 and 84. Lindsay was just 5 floors above. She, and hundeds of others, survived the impact. They did not know — they could not know — that the South Tower would collapse in less than one hour. And that was all. Lindsay, like more than 1/3 of the employees of Keefe, Bruyette and Woods, died that day. Neither fathers nor mothers, husbands nor wives, brothers nor sisters could save them. Although the most important tragedy of 9/11 is the deaths of thousands of innocents like Lindsay Morehouse — thousands of people who gave more to life, and had more left to give, than we can ever full know — the rest of us must shoulder the burden of survival, of wondering what we might have done differently to save them, of worrying about the telephone call which might come to us someday. As long as there is an EphBlog, there will be a remembrance of the three Ephs who died on 9/11: Howard Kestenbaum ’67, Lindsay Morehouse ’00 and Brian Murphy ’80. Previous entries here and here (warning: kleenex required). It is amazing how much the trauma of that day lives on. How long will messages like this be on-line, a constant reminder of the turmoil of those blue September days? Howard Kestenbaum worked at the top of the south tower, the second to be struck. In the midst of chaos, his was a voice of calm and reason in the 78th floor sky lobby as people waited anxiously for the express elevators that were to take them to the ground floor. They could not know about United Airlines Flight 175, just minutes away from impact. Kestenbaum was an athlete and wrestler at Williams. The College should honor him in a similar fashion. With luck, the class of 1967 is working on something in conjunction with the planning for its 40th reunion. Howard Kestenbaum was, like me, a Ph.D., a builder of models, a quant operating in the rarefied world of risk analysis. Yet only a modeller can know that models don’t really matter, that who we are and what we have done is much more to be found in the families we cherish than in the money we make. Howard was a really good man. That may seem an ordinary epithet, but Howard thought of himself as an ordinary man — an ordinary husband, an ordinary father and an ordinary friend… He loved and cared for his family, helped friends, visited with the homeless, lonely and infirmed. His modesty and leprechaun smile belied how quiet and graceful, without fanfare, the shining spirit of an extraordinary good man can touch and transform others. He would have been surprised that anyone noticed him, for that is not what he sought. And that is why we who love him are so honored to have known him, if only for a moment. As long as there is an EphBlog, we will try to remember the Eph victims of 9/11. They were: Howard Lee Kestenbaum ’67, Lindsay Morehouse ’00 and Brian Murphy ’80. That is the same thing that I say when I come home from work each day. It could have easily been me, or thousands of other middle-aged Eph business folks, in the Towers that day. Why Brian Murphy and not us? I don’t know why the deaths of these three Ephs affect me so much. Three thousand other people were murdered that day, each as innocent and good as Brian Murphy. Hundreds of other Ephs died that year. But affect me it does. Leila and Jessica are now 7 and 8. As I head out to coach my own 8 year old daughter’s soccer team this afternoon, I pray that whoever is coaching the Murphy girls keeps a special eye on them. They are all our daughters now. 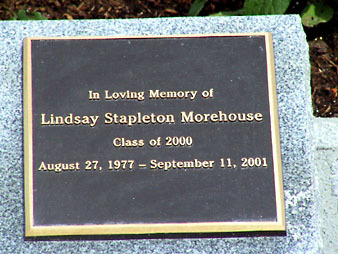 Lindsay Morehouse ’00 died 2 years ago today in the attack on the World Trade Center. I think that 4 other Ephs died that day, but I can’t confirm it. The New York Times article on Lindsay, from their Portraits of Grief series, is heartbreaking, like hundreds of other such articles. 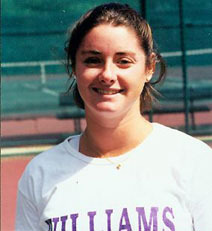 I didn’t know Lindsay, but, in reading about her and the other Eph victims in the Alumni Review, I was struck by how easily it could have been my mother (New York City professional) or my wife (tennis playing Williams graduate) or my daughter (frequent flyer out of Boston) killed on that fateful day. EphBlog is powered by WordPress and delivered to you in 1.030 seconds using 35 queries..